Aerial view of small village in Norway, Hamnoy. This is a small fishing village on the lofoten islands, and popular tourist destination with its typical red houses and natural beauty. 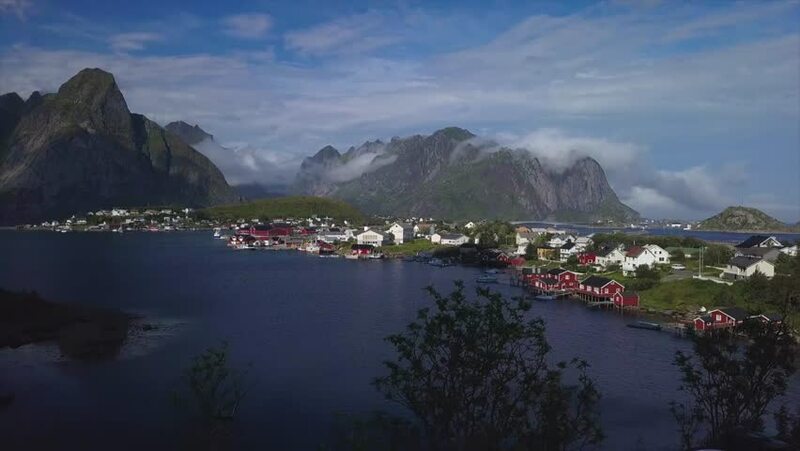 hd00:30Aerial footage of picturesque fishing town of Reine on Lofoten islands in Norway, with its typical red buildings, popular tourist destination. 4k00:30Aerial footage of picturesque fishing town of Reine on Lofoten islands in Norway, with its typical red buildings, popular tourist destination. Aerial 4k Ultra HD. 4k00:45Shooting from the air of summer sunset Ordzhonikidze village in south-east coast of Crimean peninsula. Space landscape coast, deserted beaches, beautiful mountains, fishing nets and boats, buildings.